CWC heavy-duty tarps are UV and water resistant. 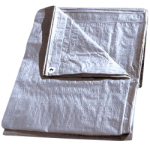 Used for general cover and protection from sunlight. Manufactured from a heavy polyethylene material for long product life.